We all love our pets and easily forgive them for minor carpet related accidents. But what is the best pet stain carpet cleaner on the market? I have a been a professional carpet cleaner in Tampa FL for several years and I only trust one pet stain carpet cleaner, Chem-Dry's World Famous Pet Odor Remover. I've tried a lot of pet urine cleaners and nothing works as well as this cleaner. It is by far the best pet stain carpet cleaner I've ever used. We've all walked in to a room and stepped in something wet left by our dearest friend and family member. After discarding our wet socks we start to look for something to remove the undeniable stain. It is the easiest cleaner to use. It does not require and scrubbing or need to be dried excessively. After some light cleaning of the spot you just pour the Pet Odor Remover on the stain and let it sit for about 30 seconds to make sure it saturates all the urine in the carpet. Blot up some of the excess solution, then cover the stain with a slightly damp towel for 24 hours. When the spot drys completely the odor and stain will be gone. There is a catch though, It only works if the spot is still wet. If you don't find the stain before it dries this product is not as effective on older stains. Most enzyme based products do not work well on dried urine stains. Once urine dries it crystallizes and becomes much more difficult to treat. To remove dried urine stains from carpet requires a treatment only professional carpet cleaners have access too. If you live in the Tampa FL area call Chem-Dry of Tampa to get a free estimate for dried pet urine removal. 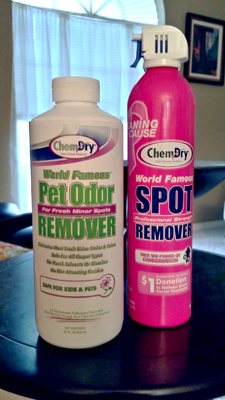 For the best pet stain remover call Chem-Dry of Tampa today.